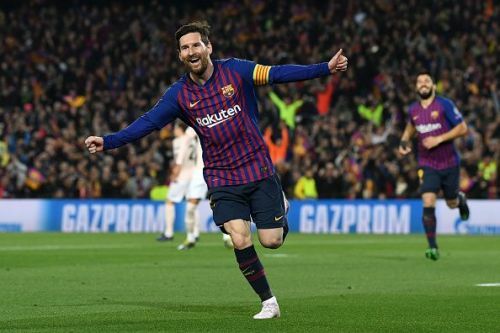 Barcelona captain Lionel Messi has extended his Champions League goalscoring record against teams from the English top-flight, following his brace against Manchester United on Tuesday night. Barcelona hosted Manchester United for the second leg of their Champions League quarter-final fixture last night, in a game that saw the Catalan giants register a thumping 3-0 win over the Premier League outfit. Messi's brace and a Philippe Coutinho goal helped the Spanish league leaders to a massive 4-0 aggregate win and a semi-final spot in the competition. "Messi always appears. Not only in moments, but in the games as a whole. He scores but is also the offensive weight of our team. "We have done two good games. That is what you have to do to be able to continue in the Champions League and that you consider us more or less favourites. Before the Champions League clash last night, Messi held the record for the most Champions League goals against English clubs, with 22 successful efforts. His brace against Manchester United has now extended this record to 24 goals against Premier League clubs in 32 games: Arsenal (9), Manchester City (6), Manchester United (4), Chelsea (3) and Tottenham (2). This means the 31-year-old has more goals against the top six English clubs than the likes of Wayne Rooney, Harry Kane and Robin van Persie. Barcelona will face either Liverpool or Porto in the Champions League semi-finals, with the two sides set to clash tonight. The Catalan giants, who have a nine-point lead in La Liga, will next face Real Sociedad on Saturday night.